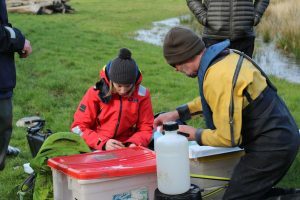 On Tuesday 6th February, Bournemouth University Research Associate Katie Thompson from the Department of Life and Environmental Sciences (SciTech) joined the SAMARCH (Salmonid Management round the Channel) team in search of sea trout in the river Frome. The five year EU Interreg Channel Programme funded project (2017-2022) will track juvenile salmon and juvenile and adult sea trout through four English and French estuaries to fill the gaps in our knowledge of how quickly fish migrate through intertidal habitat, their migration pathways and where adult sea trout spend time at sea. Currently, 95% of our salmon and sea trout die at sea, compared to only 75% in the 1970s. The project aims to answer the question of what proportion of this mortality occurs in estuaries and coastal waters compared to the open sea by using small acoustic and data storage tags. The project includes 10 partners from France and England who are a blend of research and regulatory organisations, and key stakeholders (Bournemouth University, Game and Wildlife Conservation Trust, University of Exeter, INRA Science & Impact, Environment Agency, Salmon and Trout Conservation, Agro Campus, Agence française pour la biodiversité, Normandie grands migrateurs, Obersvatoire des poissons migrateurs Bretagne). If you would like to know more about the project then you can follow online via:http://samarch.org; http://www.wessexportal.co.uk/category/samarch-salmonid-management-round-the-channel or contact Katie Thompson on thompsonk@bournemouth.ac.uk or Genoveva Esteban gesteban@bournemouth.ac.uk.